Capstone | Doha, Qatar apartments lease and rent. | Comfy and Homey Porto Arabia 1BR FF Apt. - Capstone | Doha, Qatar apartments lease and rent. Great news! A one-bedroom fully-furnished apartment at Porto Arabia – The Pearl is waiting for its rightful tenant. Rent it now at QAR 9,500 monthly. Take the chance to live in your dream house now! The Pearl – Qatar, being a destination and also an experience that blends residential charm with the comfort of an exclusive resort, houses Porto Arabia Tower 24 known for beautiful balconies that give an astonishing view. Lowest Rate! 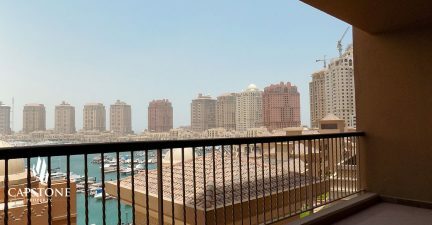 Porto Arabia 1BR Apt.